Tickets for North Miami Brewfest are now on sale. Members of the FIU family receive a discount off their ticket purchase. Type in NoMiBrew10 to get 10 percent off the price of your tickets. Beer is the most popular alcoholic beverage in the United States, but how much do you really know about the frothy brew? 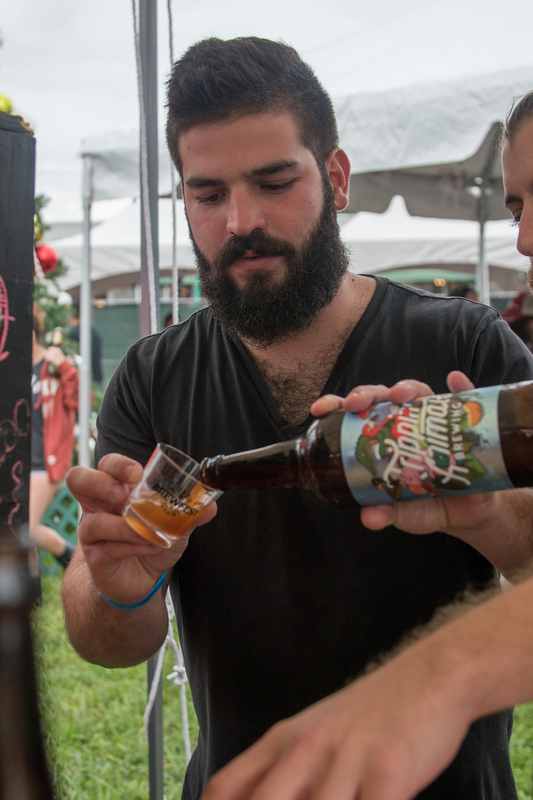 Whether you obsess over the perfect pour or just enjoy popping a cold one at the end of a hot day, the 2018 North Miami Brewfest will offer insight into your next pint. More than 30 breweries will pour 70 different craft beers at this year’s festival Nov. 10 at MOCA Plaza. Three beer and brewing seminars by experts in the field will cover brewing for beginners; how to bake with leftover grains after brewing; and beer’s role in history. This year, food is included in the price of admission. That’s a lot for one afternoon, so we asked Barry Gump, Chaplin School of Hospitality & Tourism Management’s Eminent Scholar Chair in Beverage Management, how to make the most of the experience. Gump started the brewing sciences class at FIU and inspired students to educate South Florida about the science and art of craft brewing. First, a group started a homebrew club called B.R.E.W. FIU. In 2012, Zhilong Yang ’13 came to Gump with an idea to hold a beer festival and bring homebrewers and professional breweries to FIU to give out samples. Within four years, the one-day festival won the sponsorship of North Miami, which has provided the new venue in its downtown. Proceeds benefit the school’s brewing science program. Gump says it’s impossible not to have a great time at the festival. “With a little planning, it should be a marvelous time. If you are really interested in beer, you’ll have the opportunity to meet some brewers and get to know more of what you like,” he says. With more than 70 beers on tap, you’ll need a cheat sheet to cover your favorite types of beer and have time to try some new ones. Peruse the beer list beforehand. See who’s attending and what they’re bringing. Maybe even exchange emails with the brewer, Gump says. That way you’ll know what to look for. On the day of the festival, start with what you like. Ask the brewers questions about what’s on tap. “I like to ask what’s their favorite beer,” he says. Once you have your beer in hand, take the time to appreciate it and note all the aspects that influence whether you like the brew or not. Does it have a good amount of head (frothy foam on top of beer) and head retention? Learn about the science behind beer foam. Is it appropriately clear or cloudy? Notice range of color. Notice the smell. Is it citrusy? Chocolaty? Floral? Then finally, what does it taste like? Bitter? Sweet? Acidic? The right glass for the right beer. Ask the brewer what is the best glass for the beer. A Pilsner? Tulip and thistle? Snifters? The right beer glass can take your beer-drinking experience to new heights. “There seems to be more diversity in beer glassware than with wine — even at a bar,” Gump says. Beer Advocate has a great guide to beer glasses. Learn what food works with your favorite beer. “If you like a particular wine, you’ll like it with anything. The same applies to beer,” Gump says. But, it can be even better with the right food. Try it yourself. “Try every type of food with every type of beer and find what you like. It is very personal,” he says. Beer festivals are great places to learn about what’s the next trend on the horizon. Gump says many brewers will likely bring sour beers, currently the hot item purposely made to be more sour. Label art has also become a big part of craft brewing and, therefore, the fan experience. Proceeds from the North Miami Brewfest benefit the Chaplin school. And those who will be pouring beers, the ones working for the burgeoning craft beer industry, have something in common. 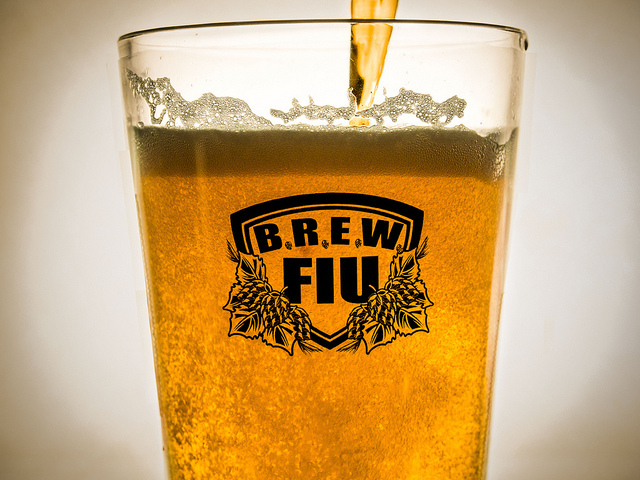 Many of them were those students who helped pioneer FIU’s beer program. “It’s always a joy to see [former students]. I get excited and get to see people who are now my friends,” Gump says. Finally, take photos of what you like so later you can enjoy some great brews with family and friends. Tickets for the festival are now on sale. For $40, admission includes unlimited beer sampling from 1– 5 p.m., food, a commemorative tasting glass and beer seminars. VIP tickets, at $65, allow for access an hour earlier (noon to 5 p.m.), a limited edition North Miami Brewfest shirt, a commemorative glass and backpack as well as seminars. Members of the FIU family receive a discount off their ticket purchase. Type in NoMiBrew10 to get 10 percent off the price of your tickets.